I took a look at my printer and I started mapping out the improvements I would have to make to my printer. The pros and cons just churn out one answer 1.75 mm filament and bowden extruder. I ordered a left hand (and a right hand bowden extruder kit. I ordered both because I did not know which one I would need because there was no information in the descriptions that described them well, but they were incredibly cheap. I also ordered an E3D hot end for the 1.75mm filament. Looking at my printer in the enclosure and pictures of printers with bowden extruders I realized it would be unlikely that I could have the filament outside the enclosure anymore. This is mostly because it would need to go through the bowden extruder and bowden tube and I did not have much height available to put the bowden extruder and stepper motor on top of the frame, so I went in search of a filament holder\roller that I could place inside the enclosure. I mentioned in a previous post I am reduced to printing on my Turnigy Fabrikator mini printer whatever I chose had to be small enough to be able to print on the 379 mm square area. I ended up printing a version of this one. To get it to print on my printer I had to chop it in to several pieces. Then I used pieces of Meccano (Erector set) to rejoin the pieces. This will only be temporary because I will reprint the base part once my large printer is back online. I have to say I am still impressed by the Turnigy printer. It did a great job of printing. 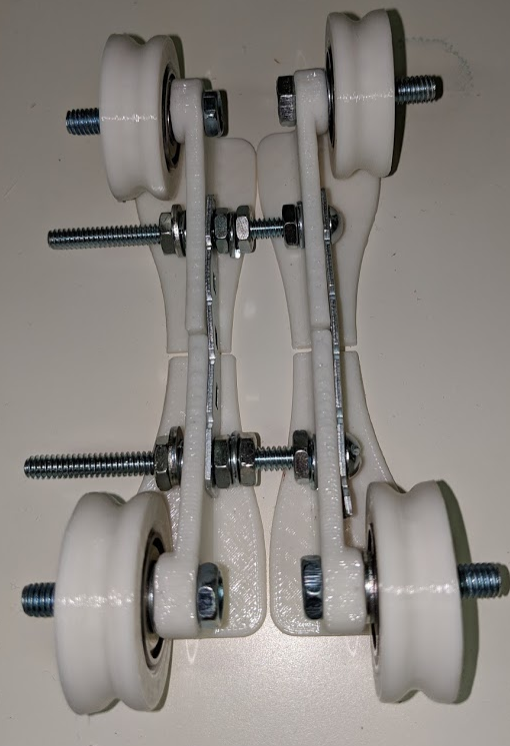 I inserted the four bearings and they fitted the wheels perfectly, and adjusted for a 0.5 kg spool of filament it is very smooth. Next If you’re happy and you know it clamp your heat (sink).